From oriental carpets to tribal rugs, the luxurious productions of antique rugs by weavers from the East have always been in demand by western homes and collectors since the days of Marco Polo (a Venetian merchant traveller of the 13th and 14 century) and the development of long distance travel. There are six main classifications of antique oriental carpets and each type is usually named after its area of origin or that of its weavers. Out of the main classifications, there are 50 common types of rugs. Designs on antique oriental rugs symbolise an exceptional variety of artistic expressions found in each village and city from which they originate, with their intricate designs as varied as the weaving centres that wove them. So whether you prefer the exquisite detail found in centuries old antique Persian carpets or oriental carpets that feature abstract patterns and baroque designs from Europe, the diversity of antique rugs make them great complements and accents for any interior décor style. 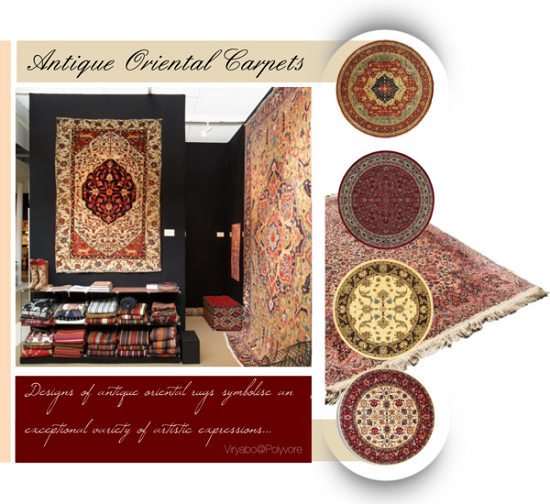 Today, oriental carpet production is highly mechanized and sold in commercial quantities. And though a few carpet weavers still hand-weave as it was done in the days of old, mass produced floor coverings is what you’ll mostly find in today’s market. Mass production of oriental carpets (inspired by antique themes) has affected quality with the use of less than perfect craftsmen, cheaper weaving materials and modern chemical dyes. Today, the few authentic hand-woven antique rugs are mostly found in museums, in the homes of the very wealthy, and with ardent collectors.